The 120mm fan guard prevents the cabinet cooling fan from being damaged by foreign objects while the fan cools electronics. Our wire fan guards allow for more airflow through than perforated metal fan guards and mesh fan guards. 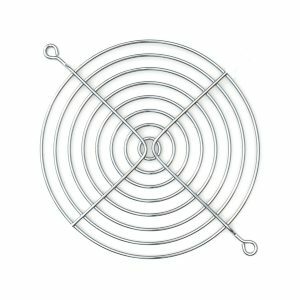 The 120mm wire fan guard is steel and nickel chrome plated to keep it lasting for years. Wire fan guards and fan accessories from GardTec are manufactured to provide reliable protection of vital electronics.